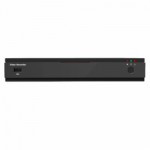 Our Cobra range has now been updated to a fully hybrid Digital Video Recorder (DVR). Now compatible with all Analogue and Analogue HD formats including HD-TVI, AHD, HD-CVI and full backward compatibility with existing Analogue CCTV cameras. The best thing about this range is that all Cobra DVRs can now accept IP CCTV cameras to create a fully integrated surveillance system.